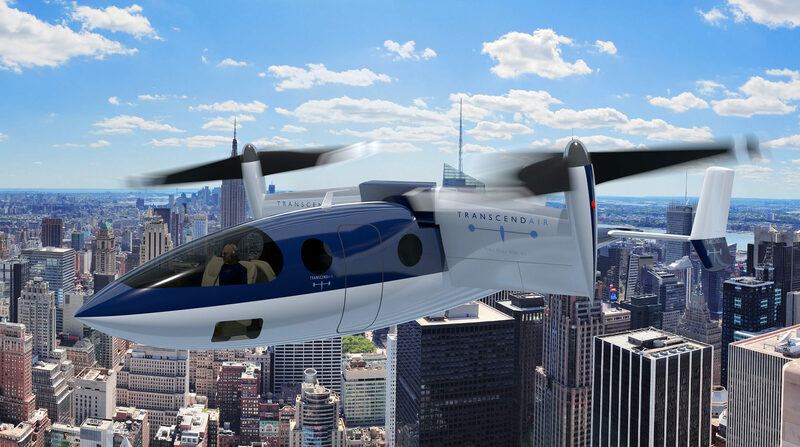 The Transcend Air Vy 400 is a luxury-interior vertical take off and landing aircraft designed for Transcend Air's 'VIP' air taxi service set to launch in 2024. The initial three routes the company plans to offer are NYC to Boston, LA to San Francisco and Montréal to Toronto for prices between $280 and $330. The company claims that the aircraft is ready to build due to its use of proven technologies already on the market. The aircraft itself will sell for about $3.5 million. Gregory Bruell is an entrepreneur, engineer, and VTOL expert. He was the Co-Founder of Elytron Aircraft. There, he built the S2 manned tilt-wing prototype. He was also an investor in Martin Jetpack, and a Product Manager at Agranat Systems. Prior to that, he was CTO at Silverback Technologies and Chief Architect at Bay Networks. Power: P&WC PT6A-67F 1700hsp gasoline engine. Vertical take-off and landing: 2 independent lift fans, which enable it to take off and land vertically like a helicopter. Once in flight, it has a fixed wing that tilts into position for a cruising speed three times that of a helicopter. Fixed wing flight: On a two propellors, which tilt for vertical use as well. Speed: Max speed of 405mph. Regulation: Transcend Air has already started the certification process with the FAA and is optimstic about FAA certification soon. It plans to start test routes between Boston and New York City in the next two years. Members at Transcend Air include former employees at the FAA and at Linear Air, a Part 135 online charter marketplace. Transcend Air suddenly emerged late this last September. While the company claims to have been developing prototype models since its founding in 2009, it has flown relatively under the radar until now. This may be because it was waiting until it had reached a certain stage of development before making itself publicly known, or because it was waiting until it could set a launch date with as much certainty as possible. While not much is yet known about Transcend, its team seems to be qualified and well built, and its concept is good. With all the intra-city VTOL services for the general public being released like Uber and Lilium, there is certainly a market space for the longer range 'VIP' air taxi service Transcend Air is offering. Transcend tackles a different problem than those existing services: it focuses on the current frequent business traveler who doesn't like the time or cost of traveling by private jet or commercial airlines between cities, and provides them with a point-to-point affordable solution.